The ultimate "boy's toy" - a high-speed land and water vehicle - has been launched on the River Thames. The amphibious vehicle is designed to reach speeds of 100mph on land and over 30mph on water and can switch between the two surfaces at the switch of a button. 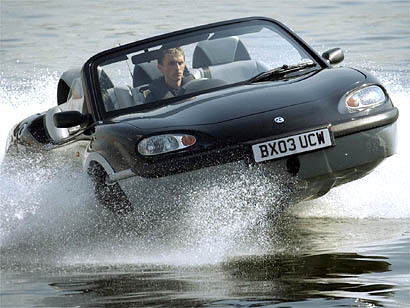 According to its designers it is neither a boat with wheels nor just a waterproof car. 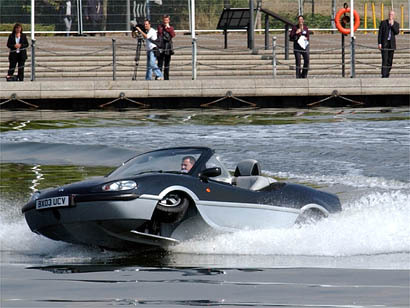 Gibbs Technologies says that no other road-legal amphibian has managed to exceed 6mph on water. Since the invention of the car, there have been many attempts to develop amphibian vehicles. Previous attempts have failed because of the vehicle's inability to climb out of the water and skim along the surface. However Neil Jenkins, managing director of Gibbs Technologies, claimed this engineering breakthrough was a world first. He said that by licensing the technology a whole new spectrum of vehicles would be born. The company is currently producing a launch series of 100 vehicles due to be available later this year. The Gibbs Aquada Bond Series will cost £150,000. The company believes that people will pay for the "freedom and experience" the novelty vehicle will allow. Although the makers hope their vehicle could be used for leisure, they say the technology could one day service the military, emergency and rescue services.